Is Apple Making iPhones With Illegally Mined Indonesian Tin? Samsung is. 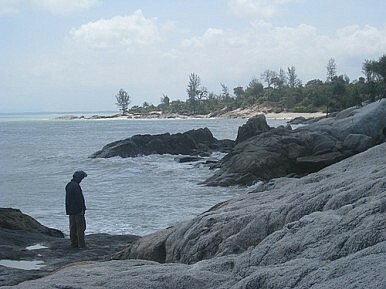 Bangka Island has long been known for its abundance of precious metals. After the Dutch colonized Indonesia in the 19th century, cheap Chinese laborers and indigenous people were put to the task of digging mines. That practice continues today due to the high demand for consumer electronics. The tin that modern Bangka Island miners collect, in the form of cassiterite, is used as solder in some of the industry’s most popular smartphones and tablets. “Indonesia's national tin corporation, PT Timah, supplies companies such as Samsung directly, as well as solder makers Chernan and Shenmao, which in turn supply Foxconn (which manufactures many Apple products). Chernan has also supplied Samsung, Sony and LG. So it is highly likely that the smartphone or tablet you use has Bangkanese tin in it,” said The Guardian. Tin miners, often working solo or in very small groups, make roughly $15 a day for incredibly dangerous physical labor. Many work in deep pits, where collapses and landslides can bury miners alive. Activists claim that this method results in 100-150 deaths each year. The lush forests around each mine must be bulldozed, leaving visible scars on the once pristine tropical landscape. To raise awareness about Bangka Island tin and its widespread prevalence in sought-after gadgets, Friends of the Earth staged an “undercover” campaign, attaching small green tags to Apple products at retail outlets around the globe. The tags read “Do I trash forests?” followed by the social media hashtag #makeitbetter. Friends of the Earth say that its campaign has yielded 24,000 signatures from concerned consumers who want Apple to come clean about its usage of Bangkanese tin. The question remains: If Samsung and Apple abandon Bangka, how else will the miners provide for their families? Moto X: Could Motorola Compete with Apple, Samsung at $300 Price Point? Goldman Sachs analysts predict a Nexus 4-like price for an off-contract handset.